FILE - Thousands of Nigerian refugees, fleeing fighting, have arrived at the Minawao camp in Cameroon, March 3, 2015. Aid agencies are sounding the alarm about severe food insecurity throughout northern Cameroon as a result of the Boko Haram conflict. This month, 70 children suffering from malnutrition have needed medical attention at the Minawao refugee camp. However, says nurse Irene Mbarga, the hospital has limited resources to treat them. The families are not able to provide enough food, she says, and malnutrition is making other health conditions worse. Mbarga told VOA that about three quarters of the cases the hospital sees are related to malnutrition. When the hospital is running short on supplies, she says, the staff can only provide first aid. FILE - A family of refugees that fled their homes due to violence from the Islamic extremist group Boko Haram sit inside a refugee camp in Minawao, Cameroon, Feb. 25, 2015. The Minawao camp is home to more than 50,000 refugees, a majority of them women and children. More displaced people live in host communities. 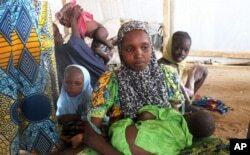 Dr. Abdoul Mustapha of the Cameroon medical council in Mokollo, far northern Cameroon, says local residents also have been bringing their children to the refugee camp hospital. Local health clinics are not set up to deal with malnutrition. The rate of simple malnutrition has increased from 7 percent last year to nearly 12 percent now, Mustapha says. Cases of severe acute malnutrition also are on the rise, signaling an emergency. Cameroon's Ministry of Public Health and the United Nations say more than 100,000 children in northern Cameroon currently suffer from acute malnutrition. This part of Cameroon was already grappling with high rates of chronic malnutrition, as much as 30 percent among children, before the Boko Haram conflict arrived in 2014. The mass displacement, including the influx of refugees from neighboring countries, has only made the situation worse. 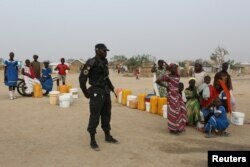 In addition, insecurity has made farming impossible in some areas, while herders have lost their animals to insurgents. FILE - A Cameroonian police officer enforces order in Minawao, Cameroon, March 15, 2016. "The situation of malnutrition, or food insecurity, reflects not only the fact that we are not able to grow sufficient or enough food, but we do not have the access to that and we do not have sufficient means in order to maintain access to health services, in order to maintain and address young people when they have diarrhea, for example,” said Barbara Sow, the Cameroon representative of the U.N. Fund for Population Assistance. “So the challenge for the U.N. is making the link between a humanitarian response today, bringing it food so that young children and families can eat today, but making sure that they have the means by which tomorrow, they are not in the same position," she added.